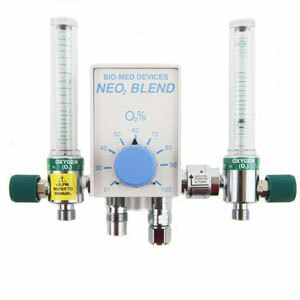 The NEO2 Blend series represents the ideal blender model for the NICU application. 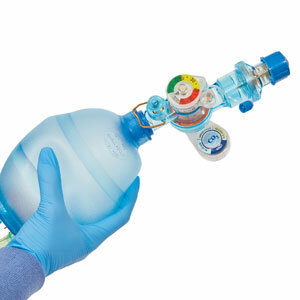 It comes with a 0-15 lpm flow meter close mounted to the left hand side (this makes an perfect spot to attach a resuscitation bag). 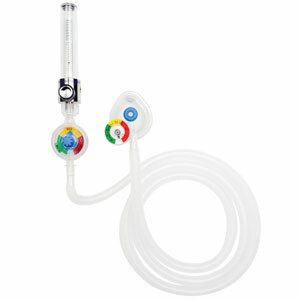 The right side comes installed with either a 0-1, 0-3.5, or 1-15 lpm flowmeter (depending on the model you choose), which allows for use with a nasal cannula, CPAP, etc. The right side flow meter is installed on an integrated bleed control switch: when the right side is not needed, the bleed flow (3 lpm) can be disabled by pushing and rotating the flow meter forward when needed, simply return it to the upright position and use as desired.